Have you ever taken so many photos for your family, friends and special events? One fun-filled way of sharing them is to make a photo slideshow. That helps back up the memories in your life. 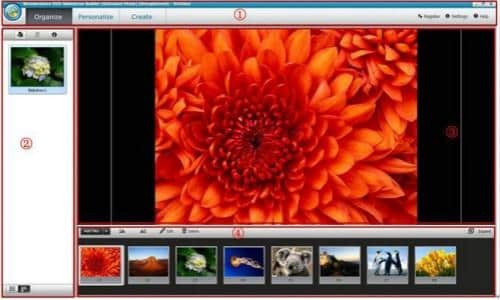 What’s more, it can all be done in just a few simple clicks if you use slideshow maker like DVD Slideshow Builder Deluxe. With this programs, you can easily weave photos and video into work of art to amaze anyone. Here let's see how to easily and creatively make a photo slideshow and burn to DVD with these all-in-one slideshow tools. Download and run DVD slideshow builder, then follow the steps below to see how to make a photo slideshow. After running the photo slideshow maker, you'll start from the "Organize" tab. On the interface, there are two Add Files buttons any of which you can click to add your photos and videos. Then just drag and drop photos or videos to arrange their order on storyboard. If you want to edit the photos, click "Edit" to add effects, crop photos, repair red-eye or add caption. Tip: To have a large viewe of all the files, click the “Expand” button on top right corner of storyboard. When importing your files, more than 100 transition effects will be randomly and automatically applied between every two photo or video. However, you can change them anytime in the "Personalize" tab. Just drag and drop a transition from the list to the thumbnail between two slides. You can also add effects, motion or intro/credit as you like. Adding music can greatly enhance the vibe of your photo slideshow. To achieve this, click "Music" on the storyboard. This photo slideshow maker enables you to add several different pieces of music according to your needs. If you want to add your own voice, just click "Voice Over" to record and then add it to the slideshow. Go to the "Create" tab and click the "Preview" button to make sure the photo slideshow is good enough. Go back to Personalize tab to change if necessary. When you are happy with the result, choose the options on the left to export photo slideshow to DVD, PC, portable devices, etc. You can also directly upload slideshow to Youtube and send message to Facebook and Twitter friends. Now sit back and relax, it'll only take a while to get your photo slideshow for sharing anywhere.